Last month King County Executive Dow Constantine visited RASKC to sign a new five-year agreement for us to provide animal services to 24 cities. This contract will be automatically extended for an additional five years, providing stability for animal care in King County for the next decade. Hurray! RASKC manager Gene Mueller provided tremendous leadership in this very successful effort, along with great support from King County Executive Constantine, division head Caroline Whalen, department leaders Norm Alberg and Sean Bouffiou, agency Administrator Lluvia Ellison-Morales and Lead Sergeant Tim Anderson. For the past many years Sheryl has been one of RASKC’s most prolific and humorous foster volunteers. She is one of four volunteers who has officially contributed more than 1,000 foster hours in each year for at least the past four years. 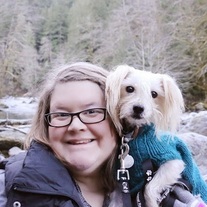 She also often steps up to help out with a variety of volunteer needs, like staffing a RASKC booth at a community event or helping out with pet visits at a local retirement home. Sheryl almost always regales staff and other volunteers in laughter at RASKC’s Annual Springtime Foster Volunteer Dinner. Read more on our page! Register here for RASKC’s pet photo class that will be taking place on Saturday, October 14, from 1:00- 3:30pm in Kent (no charge). Taught by acclaimed professional photographer and animal rescuer Brooke Mallory, the session is open to people of all skill levels. Brooke is a very engaging instructor who always receives top ratings from class participants. Not only will you sharpen skills to post pet photos on to RASKC’s website and Facebook page, plans are in the works to provide volunteers with an opportunity to share photos on a new RASKC Instagram account too. It's hard to miss us now! If you haven't seen it, the fences that surround the dog yard on the main street have been covered. This provides a safer environment for the dogs by protecting them from outside distractions. 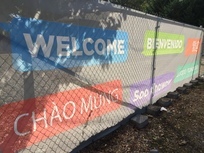 When it came to choosing covers for the fence, staff came up with the idea of turning it into a multi-lingual welcome banner (Spanish, Chinese, Vietnamese, Russian, and Somali). Animal Care Technician Adam Winston began working for RASKC earlier this year. 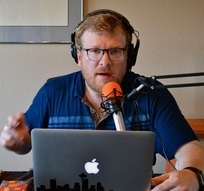 He produces a podcast called Dogs in Our World which features experts and recent research about dogs in many contexts- history, philosophy, law, art, leadership, sport, autism, and more. He recently attained a professional certificate in Applied Animal Behavior from the University of Washington. Adam also works as a Lead Dog Trainer at Kirkland Petco. Tell us about yourself. I was born in Anchorage, Alaska and spent most of my school years in Hampton Roads, Virginia. I have spent time in all 50 states, every Canadian province, and over a dozen other countries. The Pacific Northwest is where I plan to stay! Why did you decide to work for animals? While attaining my bachelor’s degree in 2015, I chose to dedicate my career to helping the people and animals in my community. Specifically, I enjoy helping people by also helping their dogs. What did you do prior to coming to RASKC? Before moving to Seattle, I was in Philadelphia where I worked in IT. Then, I attained my Bachelor’s degree in 2015. What does your work for RASKC involve? I am an Animal Care Technician stationed in the shelter. My job duties include caring for each of the animals at RASKC. I also assist with booking animals into the shelter and adopting animals out to new families. What is the best part about your job? The best part of my job is knowing that I can help animals who don’t have anyone else to care for them. What do you do when you’re not at work? When not at work, I still spend nearly all of my free time researching and learning about domestic dogs. Dogs in Our World is my opportunity to share what I learn with the public. Please share a story about an experience with a great volunteer(s). RASKC volunteers are essential to the RASKC mission. 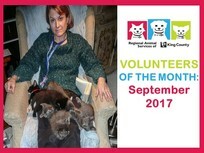 I also work as a dog trainer at the Petco in Kirkland and enjoy watching the great work volunteers do every day. The volunteers who are stationed in the Cat Adoptions building have been instrumental in teaching me more about cat handling and behavior. I’m so thankful for each and every RASKC volunteer. 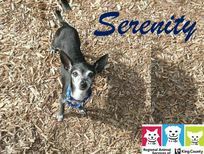 Serenity is a 12 year old female Chihuahua/Italian Greyhound dog mix (ID #A537315). This affectionate lovebug yearns to cuddle up with her humans in a new forever home. Serenity does well with other dogs, but would do best with a slow introduction to any current dogs in her new home. She does have a bit of a shy personality and would do best in a calm, quiet home. Serenity is a gentle and loving girl. She can get a little nervous in new situations, so Serenity needs a family who understands she may need some time to warm up. Once she gets to know you, Serenity will be a very devoted friend! Her adoption fee also includes a free office visit to the veterinarian of your choice, and 30 days of pet insurance through Trupanion.. Whether you're a new or potential volunteer interested in having an overview of a volunteer shift, or simply would like a refresher on how to do certain tasks, our team has been working hard to create videos that show just that! Visit the Volunteer Hub Resource to watch these videos. Every month we will be adding a new video and will ensure to announce them in these e-newsletters. Quick shout out to the team responsible for spearheading and helping in the creation of these videos: Nickie Ford, Danica Coffman, Carolyn Dunstone, Shannon Weiler, Jeanne Cossette, and BJ Morton. 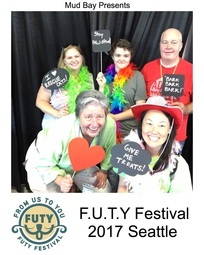 Mud Bay’s FUTY Festival: Over 25 RASKC volunteers registered to celebrate with hundreds of other volunteers and staff from Puget Sound animal-welfare organizations last month as part of Mud Bay’s annual “From Us, To You” Festival in Seattle. To see a photograph album of this event, go to RASKC’s Facebook page. Decorating Cat Boxes: About a dozen volunteers stepped up to a last-minute request to decorate dozens of cat-cozy boxes in anticipation of King County Executive Dow Constantine’s visit to RASKC last month. To see a photograph album of many of the creative designs, go to RASKC’s Facebook page. Kittens first! If you are volunteering at a venue with both kittens and cats present, remember that kittens are to be cared for first. Inform customers that if they’re interested in kittens, to view them before visiting with the adult cats. There’s no going back and forth between kittens and adult cats. This is to protect the kittens in light of their fragile immune system. 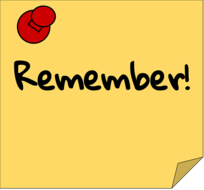 Please provide at least two weeks’ notice if you plan to resign or if you’d like to request any other major change to your schedule, like a leave of absence (being absent three or more shifts in a row). Foster volunteers who care for animals in their home are always needed. RASKC seeks volunteers who have great written communication skills and are interested in volunteering from home.